– approximately 8 weeks after the date of the paper-based exam. In case of Young Learners tests (Pre-A1 Starters, A1 Movers and A2 Flyers), certificates are available approximately 8 weeks after the exam date. Candidates are notified of the possibility of receiving their certificate by an email sent to the e-mail address given in the Cambridge English registration form. If you wish to collect your certificate personally, we invite you to our office – Cambridge English Authorised Platinum Centre PL090 LANG LTC at Al. Niepodległości 217 lok. 8 from 9am to 4pm. You can also authorise another person to collect your certificate. The authorised person must have a special document signed by the candidate Authorization to collect a certificate. 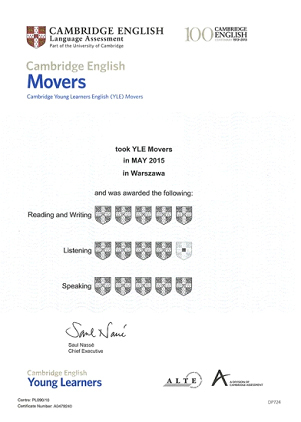 However, if while registering for the Cambridge English exam, the candidate has chosen the option of his certificate being sent to them: by a registered letter – PLN 15 or by a courier – PLN 25. Cambridge English Certificates are stored at Cambridge English Authorised Platinum Centre PL090 LANG LTC for 2 years after the applicants have been notified of the possibility of their collection and then they are securely destroyed. 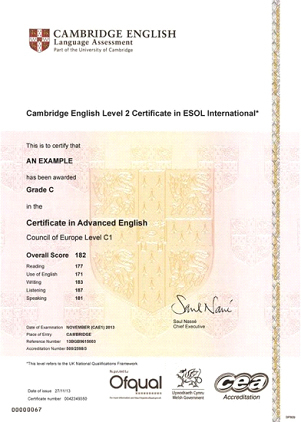 See what Cambridge English certificates look like.